That’s literally all I remember from the conversation, but when I ran into Kroger on a mission to grab “a few things” Sunday in our race to get to the 2:45 showing of Alice in Wonderland, I grabbed the following, not really sure what I was going to make with it: celery, leeks, garlic, peppers, 3 different kinds of canned beans and a few other things not meant for dinner. 1. I diced about 6 or 7 celery hearts and sauteed them in a little (2 Tbsp.?) olive oil with salt, pepper and oregano and cooked over medium heat (using my trusty new enamel pot I got for Christmas) for about 5 minutes or until they looked soft. 3. 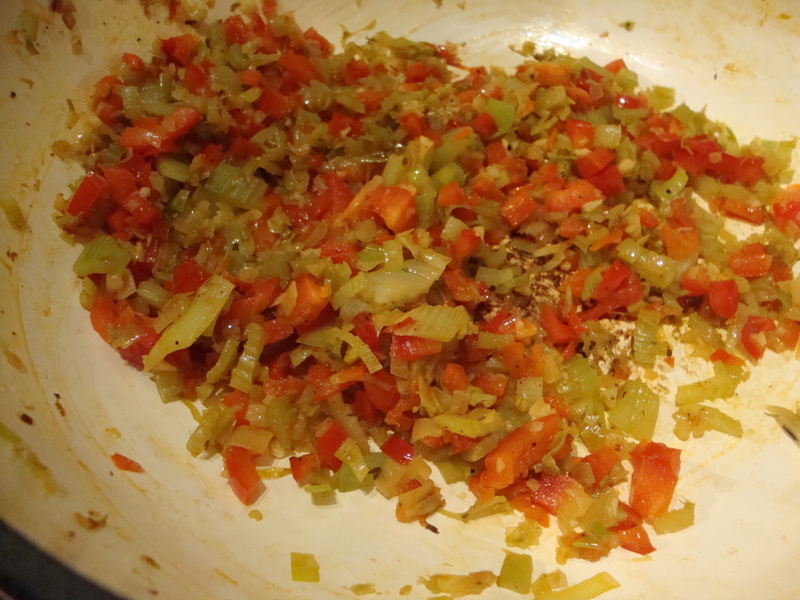 I then did the same with a large red pepper and half of a large shallot. Again, seasoning a little and cooking for about 5 or 10 minutes. 4. It’s at this point, I decided it was going to be a soup. I’m not sure why. It just seemed like a soup base. I took out my trusty tube of tomato paste* and added roughly 2 Tbsp., mixing it in well. *I finally discovered tubes (like toothpaste tubes) of tomato paste about three years ago. Since you rarely need an entire can – even the little ones – of paste, this is great for using one or two tablespoons at a time, then you just throw it back in the refrigerator until you need it again. 5. Next came some chopped kale that was a little soft and on its way out — so I figured it was perfect for soup (I think any type of greens – especially spinach – would be good too). 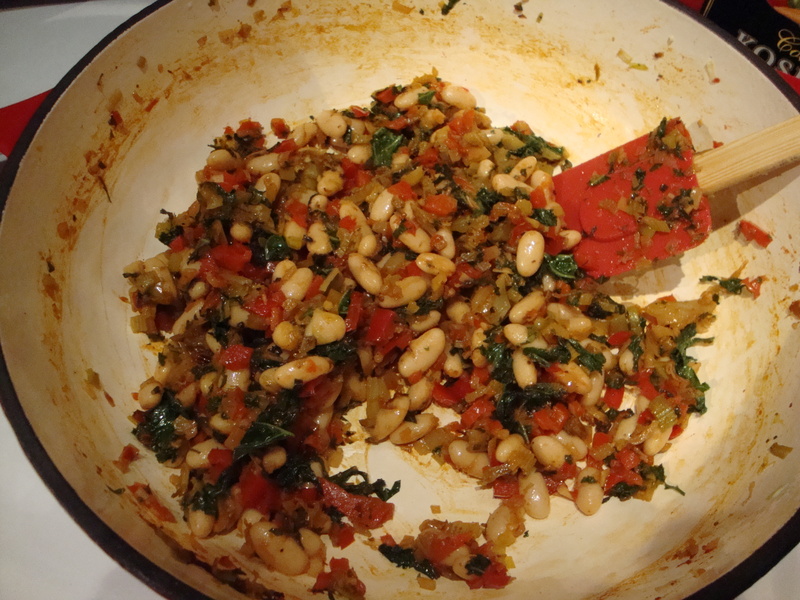 AND, one can of drained and rinsed cannellini beans. 6. I let this all cook together for a 1-2 minutes then added 3 cups of vegetable stock (2 of which was low sodium, the other wasn’t). 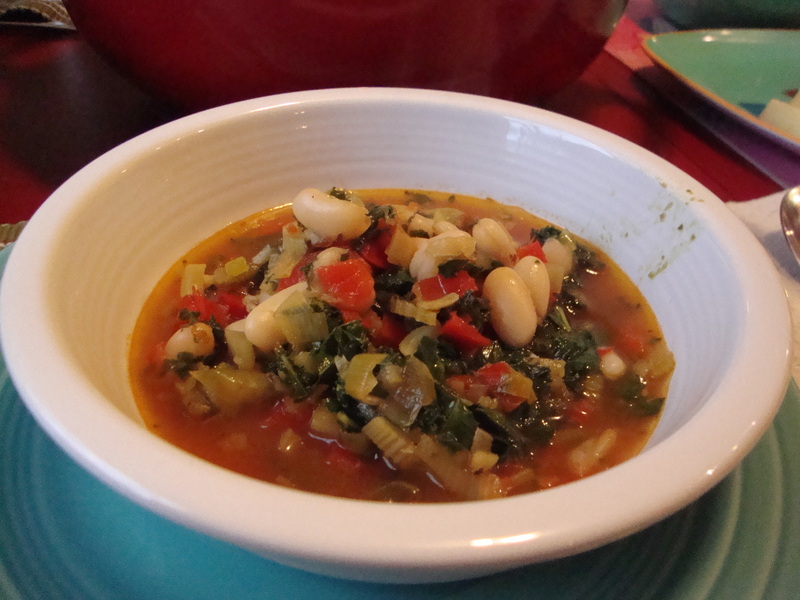 It wasn’t too soupy – more like a stew and looked good, like I actually knew what I was doing. It turned out I did! It was too salty — had I known I would turn it into a soup and where I would go with it, I probably would have laid off the salt a bit, but really I should have taste-tested it more toward the end. But, it was good! I’ll just watch the salt next time. I added water to it for the leftovers and they were perfect today at lunch. A little spicy from the pepper and not too salty. I served it with garlic bread and dusted it with a little Parmesan cheese for serving. (Curls would be a nice look too). I can’t wait to perfect this one, and figure out what the heck else I can get in there. Entry filed under: Soup, Uncategorized. Tags: bean, soup.